I haven't blogged for over a week and I'm feeling delinquent. 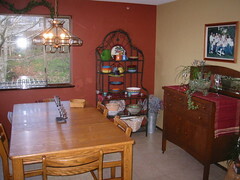 Last weekend I spent much of the time painting our dinning room and front entry. After a weekend in a condo at Big White with wild warm colors, we were inspired to go ahead with some warm colors that we had been considering. It is a lot different, and it helps warm up an area of the house that has felt cold.